« Is the Grind worth it? Are the people in your “Church” allowed to speak? Are you allowed to speak? Tommy “The Scouser” called me to say that he had a little piece written out for the funeral of our Auntie May who he was particularly close to. It wasn’t a full eulogy but it was a really short piece that perfectly summed up the character and spirit of our fabulous aunt. He was really upset reading it to me. He wanted to read it at the funeral mass but wasn’t sure if he could manage actually saying it without getting really upset. If that was the case he wanted to know that I was in reserve to read it for him. I knew he would be fine but agreed in any case. On the day of the funeral I was asked would I do a reading along with some of the other family members. I did my piece and I wondered what was going on as the funeral mass drew to an end and there was no sign of “The Scouser” going up to the altar – maybe he decided he wasn’t up to it after all?..I wondered. The funeral party moved on to the cemetery where Auntie May was laid to rest as the priest said the final prayers. Just as he finished I noticed Tommy making his way to the microphone (much to the surprise of the priest) and he did May proud by reading his beautiful and very emotional piece, which was greeted by a huge round of applause from everyone standing in the sunshine in the peaceful country graveyard. This was a really special moment as it was the only true occasion during the whole funeral process where the family put a “personal” stamp on the proceedings, where a “real” voice was heard and in some small way he said what we had all felt and wanted to say. I wondered why Tommy had left it so late in the day to read his piece and was totally shocked to hear that the priest in question “did not allow” people to say such things and would not allow it at the mass! This has left me bewildered and quite furious and while I know it is not the usual behaviour of the church it does give you an insight into some of the odd and very old and traditional thinking that has turned so many people against them in recent times. Whose church is it anyway I thought? Whose memory were we all honouring? The more I thought about this the more I reflected on all the other organisations where there are people that have very important things to say but just aren’t allowed. It’s easy to lose sight of what an organisation is about and its even easier to block the real important voices from being heard. This entry was posted on February 9, 2012 at 3:11 pm and is filed under Personal development, PR, Self Help, Uncategorized. You can follow any responses to this entry through the RSS 2.0 feed. You can leave a response, or trackback from your own site. Lovely piece again Greg! I have to say i really look forward to reading your blogs. I think perhaps every employee feels at some point in their career that they not ‘allowed to speak’ but sometimes all it takes is for you to keep at it and keep speaking up until eventually you feel you are being heard. great post Audrey …. the most dangerous time for an organisation is when people don’t even bother trying to speak because they feel it is worthless. Very perceptive Greg. An organisation that works like that is authoritarian. It then makes you believe that the rule is there for a very logical reason; that it’s in your best interest, you couldn’t come up with something to say, or what you might say is of little value. It undermines individuality, creativity and self worth. From churches to corporations its a very difficult framework to move away from. Sometimes people go to its polar opposite which is not ideal either. Somewhere in the middle there is a perfect balance of direction and input.. I have no idea where it is though! great post Rose – must find the perfect balance! Thought provoking piece Greg – I’ve seen variations of this type of pettiness before (in the United States after my father in law died). And at a time of great grief it can cause unneeded hurt and irritation. My mother in law was sufficiently agitated that she changed the funeral arrangements elsewhere! Ridiculous, isn’t it? Excellent piece Greg. The more experienced I get the more importance I put on the fact that interviews are two way affairs. Look out for signs of dictatorial attitudes at your interviews and make your own decision. I remember when working with one blue-chip multinational whose VP of HR stated that “there are no career-damaging statements” at his breakfast meetings…why did he feel the need to make this statement? How about your own brother being the priest and him not allowing you to speak about the good times we had with our mother. That happened me and knocked me for six but to find my 4 other siblings agreeing with him was the last straw. I should have done Tommy the Scouser and headed for the microphone. I was at the funeral mass of a school pal today and when the Mass was over, while waiting for the priests to come back out of the sacristy “Kingston Town” by UB40 was played. Roman Reggae Classics! Maybe they are softening! Oh my god Michael … What is wrong with them? 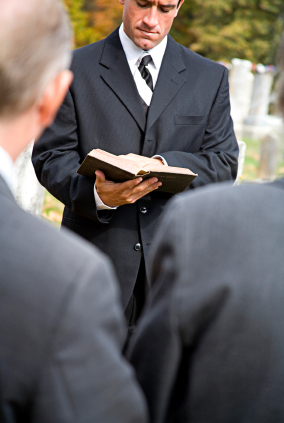 A funeral is a time when they can really connect with people and support them and make the church relevant again …. Why blow it?!! UB40 … That’s pretty cool! A very perceptive piece (as usual). To me it comes down to respect in the organisation – where it is missing or low then voices are lost or silent. Priests like that need to “addressed” or stood up to . With all that has gone on in the church they are lucky to have anyone at all in attendence at any service & this week in Rome , where archbishop Martin was not allowed to attend, speaks volumes , & proves that nothing at all has changed.They are a narrow minded & unenlightened lot at times .That is not to take from those who have done good in their time , but God it must be a frutrating organisation to work for ! !NO chance of women priests in the near future I suppose ?!
. You are right , whose funeral is it anyway? , whose aunt was it ?I must say though , there surely was great satisfaction for you all especially “scouser” when he did what he wanted to where the said priest had no jurisdiction. I’m sure your auntie May had the last laugh !